This plugin allows you to quickly see the results of exporting an image at each of the JPEG quality settings that Lightroom supports. 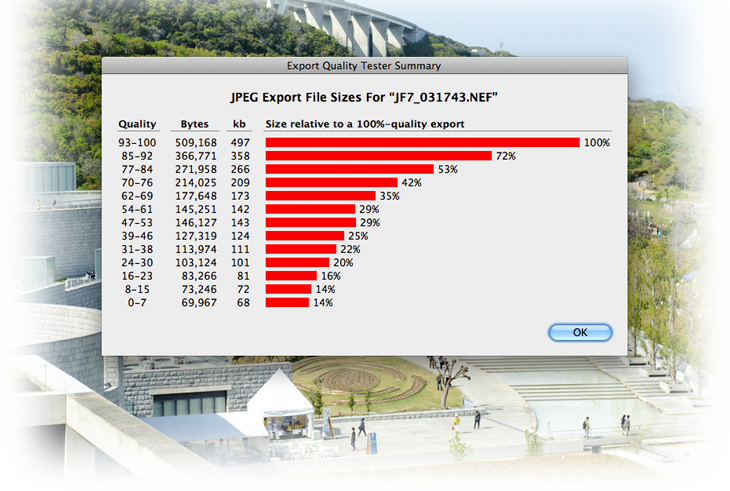 Exporting an image as a JPEG involves a compromise between file size and image quality. With many images, image quality does not increase appreciably with the last few steps in quality, but those last few steps incur a sharp increase in file size. Depending on your needs, you may want to forego the final miniscule smidgen in quality to save a doubling of the file size. In either case, being able to see, explicitly, the specific results with a specific image makes your decision more informed. Please see that writeup for an overview of the meaning of JPEG quality settings within Lightroom. 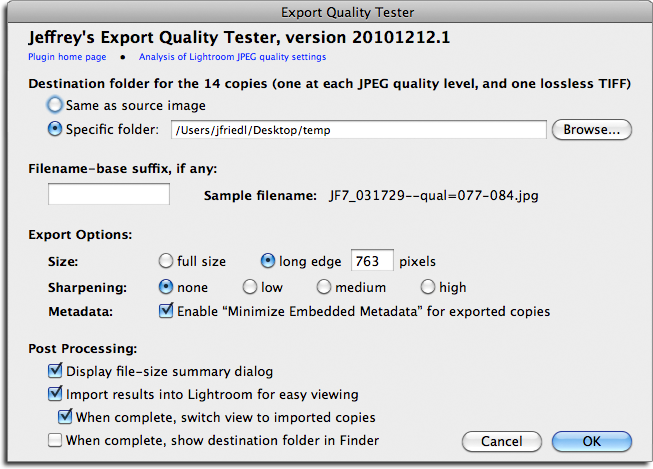 Exports a copy of the image at each of the 13 JPEG quality settings that Lightroom supports. Exports a lossless TIFF of the image. Optionally, imports those copies back into Lightroom, making it easy to immediately inspect the results. Optionally, show in Finder/Explorer the folder where the exported copies were placed, making it easier to immediately inspect the results with an external viewer. Optionally, display a dialog reporting the sizes of each of the JPEG copies (seen in the opening image above). You can also have a small dialog that reports the various sizes, as seen in the first image at the top of this post. This plugin is distributed as “donationware”. I have chosen to make it available for free — everyone can use it forever, without cost of any kind — but unless registered, its functionality is somewhat reduced after six weeks. Registration is done via PayPal, and if you choose to register, it costs the minimum 1-cent PayPal fee; any amount you'd like to add beyond PayPal's sliding fees as a gift to me is completely optional, and completely appreciated. For details, see my blog post titled Lightroom Plugin Development: Now With Added Encouragement. If you're interested in how I picked up a plugin-development hobby like this, see My Long Path To Lightroom Plugin Development. minor UI tweaks to main dialog. 20141019.35 Windows Only: Add a one-time check for the POODLE security vulnerability, and alert the user if it exists. 20140710.28 Sigh, had a bug in the Creative-Cloud support. 20140704.26 Sigh, introduced an error for some folks with the rebuild the other day. 20131031.22 The export target no longer defaults to the system temp folder... that just ends up being confusing. 20131031.21 Better error message if an image can't be rendered. 20130613.20 Better support for plugin revalidation. 20130524.18 Apparently, a recent change broke things on Lr2, which some folks apparently still use. 20130328.15 Fix for the registration system. 20120608.11 Fix an "attempt to perform arithmetic on field" error. 20120309.8 Had broken registrations in Lr2; Update to the debug logging to better track down timing issues that might arise. More on the march toward Lr4, including upheaval in the code to handle Lightroom APIs being discontinued in Lr4. Error when invoking the plugin with multiple photos chosen. 20110929.3 The new-version check didn't always work correctly. Fixed a build problem that could have caused plugin errors. 20101213.2 Updated “kb” to “kB”. (I've never been able to keep these things straight). Added an option to include the resulting file size in the filename itself. Once again, great plug-in and so useful. I really need to find so times to go back of my photo things ! A tip for Kb vs KB. “b” is for bits which is the smallest computer unit, thus explains why a small “b”. While “B” is for Bytes, a bigger unit. That’s the only way I’ve found not to mix up. Hope this will help you. I’ve found that even without recompressing at a different quality level the coding table optimizations can shave 10-20% off of a file. I’m using your “Run Any Command” plugin to launch jpegoptim.exe during eport / publish. Works perfectly! It would be great if this plugin generated a web page with the ‘hover’ links for each quality value similar to your article. Understanding that many images are in excess of the available screen resolution, maybe a user selectable resolution that leads to a ‘center crop’ at 100%. I used James Snyder’s suggestion as an excuse to start playing around with the Lightroom SDK and wrote an export filter that does the jpeg optimization. Not that there is a real reason for it to exist (see my previous post), but if anyone prefers check boxes instead of command lines you can click on my name below (it’s free and open source) and give it a try. The plugin only works on Windows for now, since I’m not in possession of a Mac to compile the included tools. Kind regards from Switzerland and thanks for your great plugins! Thank you for this pluging. We don’t always know how correctly export an image. What’s more the size dosn’t always mean something when for exemple your picture is all most of the same color. This will be usefull ! I haven’t used the tester in awhile, so when I went to use it today, it did not show up. I seen that there was a new version so deleted the old one and installed the new one. I enabled it in Lightrooms Plugin Manager and then tried to use it. Any ideas what is wrong here? Thanks.